Cycling while sleep deprived can be extremely dangerous, but the non-stop nature of most bikepacking and ultra-distance bike races encourages riders to push the boundaries of when it is and isn’t safe to be riding a bike. This page addresses the risks and effects of sleep deprivation on ultra-distance cyclists and how to manage and avoid them. Research clearly shows that car drivers who have had less sleep the night before are more likely to have a car crash than people who have had more sleep. Tiredness can cause more of an impairment to driving ability than a moderate amount of alcohol, but the social stigma attached is quite different. No scientific research has been done with cyclists on this topic, but the effects are certain to be similar. Tiredness and sleep deprivation is a hard concept to measure, but a few US states have introduced laws that define driving after not sleeping for at least 24 hours as reckless. It’s therefore clear that riding while tired can slightly increase the chance of having a crash of Types 2a, 2b, 3a and 3b (according to the list on the Causes of Bike Crashes page). The non-stop nature of most ultra-distance bike races makes Time Management important and the balance between resting and riding can be difficult to get right. How much sleep people need and how well they cope with sleep deprivation varies between individuals and it’s hard to train oneself to need less sleep. However, you should learn where your limits are, what the signs are that you are in a dangerous condition and you should make avoiding reaching that level a priority for safety reasons. Sleep deprivation can start to affect alertness a long time before it is noticeable to the individual, which makes it somewhat difficult to manage. Signs of serious sleep deprivation include blurred vision, hallucinations and instances of microsleep. If such symptoms occur then it is obviously time to stop as soon as possible and have at least a brief power nap or preferably a longer sleep. However, to maintain safety it is better to stop and rest before these signs appear. More subtle signs include not being able to recall what happened during the previous few minutes. Wild hallucinations are reported by many ultra-distance cycling veterans, and while amusing they are also very scary. The hallucinations feel extremely real and are often very bizarre, including some people having a conversation with a fictitious Alberto Contador and others seeing goblin-like creatures jumping out of the woods. I’m pleased to say that I’ve never experienced hallucinations and have only reached the blurred vision stage a couple of times, upon which I’ve immediately stopped to rest; most of the time I rest well before getting to that point. Our bodies naturally go into more of an energy-conservation mode at night-time, which makes the perceived effort needed to maintain a certain level of power output seem a lot higher. Most ultra-distance cyclist notice that it’s hard to maintain the same average speed or power output during the night than during the day, regardless of how well-rested they are. Sleep deprivation can make this effect even worse, so one indicator of needing to stop for a rest is that your energy levels are very low or the perceived effort is much greater than what you are used to for the current conditions. These effects also illustrate that continuing to ride in a sleep-deprived state is often counter-productive because energy levels and cycling power are greatly reduced compared to if a short rest is taken to restore energy and alertness. Decision making, navigation, reaction times and emotional responses can also be negatively affected by sleep deprivation. If a problem occurs when in this state, you may respond in a way that makes the situation worse rather than better. In addition to the obvious direct hazards caused by impaired bike control, continuing to ride while sleep deprived may also result in indirect safety hazards due to making poor decisions about bike maintenance, navigation, nutrition, etc. There is no better way to stay alert than to have more rest, but do any other methods work? Some people use caffeine to increase their alertness when tired. This can work quite well, but tolerance to caffeine’s effects is built up after repeated exposures, so if you want a maximal effect during a race then abstinence for a while beforehand should help. This list compares how much caffeine different drinks, foods, and pills contain. For about 10% of the population (including myself), caffeine has only marginal effects on alertness even when consumed very rarely. Tiredness at night is strongly affected by the amount of ambient light. Using more and brighter lights at night-time may therefore make you more alert, or even turning the backlight permanently on on your bike computer may help. I’ve personally noticed that it’s a lot easier to stay alert when riding with a full moon and a clear sky than when the night sky is moonless and pitch black. Our circadian rhythms cause us to be least alert between the hours of 2 and 6 am. Although it can be wise for strategic reasons to keep riding at that time, plus the roads can be relatively free of traffic and winds tend to diminish overnight, it is wise to rest during those hours to maximize alertness when on the bike. Drivers often wind down the windows or turn up the radio to stave off tiredness. However, research shows that this only has a brief effect and stopping for a nap is the only effective solution. Short power naps of under 15 minutes can be used to restore a decent alertness for several hours afterwards (see Wikipedia), but longer rests will still be needed at some point. Other tactics that people use to stay alert are having a conversation with someone, singly loudly to themself, dumping cold water over their head, and doing mental arithmetic. If even doing very simple mental arithmetic seems to be excessively difficult and causes confusion or having a conversation is a challenge then this is another good indicator that you need to stop and rest. People at the front of ultra-distance bike races are able to keep going with very little rest. Those people are likely to be the ones who are predisposed to not needing as much rest as others and are also the most experienced and know their limitations the best. To stay safe, you should not try to match their strategies until you’ve built up a wealth of experience and know exactly what your body and mind needs and where your limits are. It’s widely-known that during a race is not the time to experiment with new equipment or nutrition strategies. The same should apply to sleeping strategies – don’t try anything new during the race. During Multi-Day Training Rides you should slowly push your boundaries to know what amount of sleep is enough to keep you safe on the road so that you don’t need to experiment during a race. It’s impossible to know whether the effects of sleep deprivation or impaired alertness played any role in the deaths and incidents that have occurred in bikepacking races. However, it is undeniable that not being fully alert while cycling is a serious safety concern. Following the annus horibilis of 2017, bikepacking race organizers sought ways to improve rider safety and some chose to introduce rules about the minimum amount of time riders must spend off of the bike per day. Other organizers disagreed with this action because they felt that it might put people in a dangerous situation if they were forced to stop and rest during a section of the route where it was dangerous to do so due to weather conditions, wild animals or other factors. Most race organizers choose to leave the decision up to the participants of how much sleep they need to remain alert and safe while cycling and when they need to have that sleep. It’s wise to figure out your Time Management strategy, Sleeping Strategy and have a rough plan of your Schedule & Goals before starting an ultra-distance race. However, you should be prepared for your strategy and plans to change completely once you are on the road. Even if you plan to stay in hotels every night, you may get behind schedule for many reasons and have to do longer rides on some days and you may occasionally not find any hotel options in your destination. You could therefore end up riding for many more hours on some days than you originally expected. This could cause sleep deprivation to become a major problem, so as matter of safety you should always be prepared to sleep outside when doing multi-day, self-supported races even if it isn’t part of your planned strategy. On any multi-day ride, you should at least bring an emergency blanket (Amazon) regardless of whether you plan to use it. To be somewhat comfortable sleeping outside in a wide range of weather conditions, you will need more than an emergency blanket. An insulated jacket can be almost as effective as a complete sleeping bag when combined with other clothing and it’s smaller and can be used on the bike as well as off of it, so I would add that to an emergency blanket as my minimum level of sleeping equipment. There is a page about Sleeping Equipment that contains a lot more options and information. If you’re not carrying any form of shelter from bad weather then popular options that offer minimal shelter in public spaces are bus stops and church porches. More sheltered options may include public toilets, post office entrance halls and some bank machines are located indoors. Many people have a lot of success by simply knocking on doors of strangers and asking for a warm place to sleep at night or to pitch a tent on their land. This is a great way to meet local people but is not always the most time-efficient strategy during a bikepacking race. If you’re prepared to use private land without getting permission then shelter can sometimes be found in farm, commercial or industrial buildings. Getting off of the ground is an important element to staying warm, which is why carrying a sleeping mat is useful. If you don’t have a sleeping mat then look for a bench, discarded cardboard boxes, or anything else. 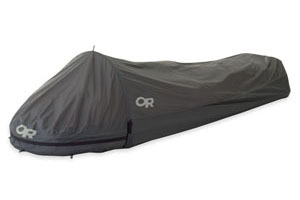 Personally, I plan to spend about half of my nights outside during a bikepacking race, so I bring a bivvy bag, small inflatable mattress and lightweight sleeping bag that is sufficient to allow me to sleep comfortably enough in almost all weather. I try to stop in rural locations that are hidden from the road where nobody cares that I’m there even if they do notice me. This page is in the Rider Safety section. The final page in this section is on Dealing With Animals, which is a common problem for ultra-distance cyclists.